I grew up fishing the Chenango River in Upstate NY, and I just took a quick trip down it on October 11th. Now granted, I had just gotten back from having spent two days at Lake Ontario, so I wasn’t expecting to have my mind blown. But I did catch about 40 smallies, and it took me a minute to figure them out but once I did I could catch them at will! So here are three tips that will hopefully help you do the same! Any bends in the river that had rocks/gravel/trees that were 5 feet deep on the outside edge and were adjacent to deep water. 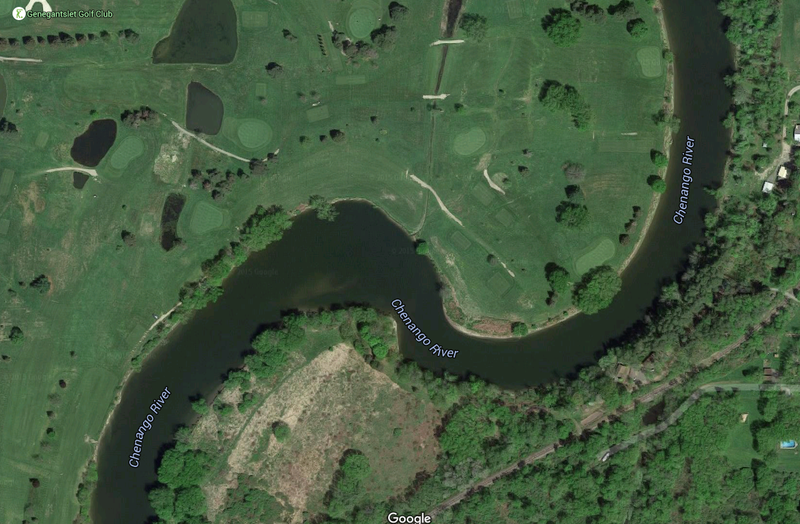 Here’s a screenshot of what that looks like from one of my favorite holes in the river, near the Genegantslet Golf course. I caught all my fish on a Bass Pro Shops tender tube, green pumpkin, with a 1/4 oz jig head. Not complicated at all. Just drift it, and work it slow. I was using a seven foot medium action extra fast rod with a high speed casting reel. 20 pound fluoro leader, 50 pound Cortland Line braid. Being quiet is key, especially in some of those low pressure areas. Trolling motors are not common for them. Stay off your tolling motor as much as you can, cast upstream, and drag it down with you as you float. If there’s too much current and you have to work your motor, try to do it as little as possible. You’ll catch more fish the quieter you can be. Good luck and post your pics in your replies! Previous Previous post: 2015 Youth Fishing Clinic rains buckets of BIG fish! Next Next post: Why you should Carolina Rig for Giant Smallies!